Sub:- Merger of 33 postal dispensaries with CGHS-reg. I am directed to forward herewith a copy of Order No. S.11011/01/2016/CGHS-III/EHS dated 21st December, 2018 of the Ministry of Health & Family Welfare on the subject mentioned above for further necessary action at your end. Subject: Merger of 33 Postal Dispensaries with CGHS – Reg. 2. All serving employees and pensioners of Department of Post (DoP) and Department of Telecom (DoT), who are residing/settled in above 33 cities and are beneficiaries of the 33 Postal Dispensaries, shall now be covered under CGHS and the Postal Dispensaries shall be rechristened as CGHS Wellness Centres. a) All Serving employees and pensioners of Department of Post (DoP) and Department of Telecom (DoT) shall have to abide by the CGHS rules and guidelines to become a member of the Scheme. They shall have to pay the requisite contribution as per the prevailing rates prescribed by the Ministry of Health and Family Welfare/CGHS DoP & DoT will take necessary action to inform their employees and pensioners in this regard. b) All existing facilities and infrastructure like buildings, furniture and fixtures equipment’s etc. will be taken over by CGHS on ‘as is where is’ basis. 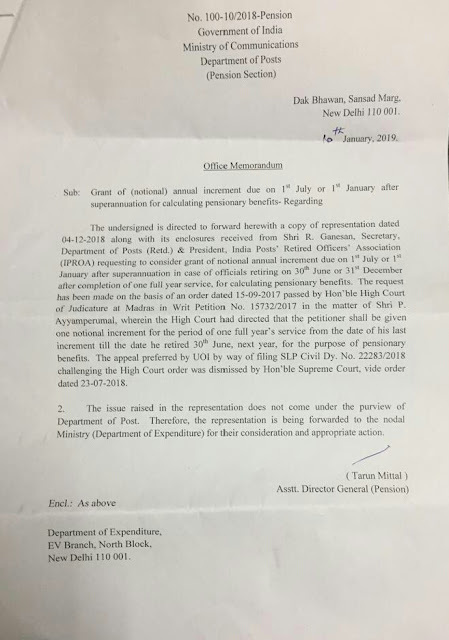 The Department of Post shall handover the possession of the Postal Dispensaries accommodation to the Department of Health and Family Welfare/CGHS at a token rent of Re.1/- per annum. In case of rented accommodations, CGHS will pay the rent from the date of taking over of the Dispensaries. c) All doctors of GDMO sub-cadre of CGHS working in the above 33 Dispensaries will be taken on roll of CGHS and they shall be placed under the administrative control of Department of Health and Family Welfare/CGHS for all purposes. d) All employees (technical/non-technical staff) along with the work allocated and posts they are currently holding in these 33 Dispensaries shall be taken over by CGHS. Their seniority and other condition of service in CGHS shall be governed by the relevant instructions and guidelines issued by DoPT from time to time. e) All expenditure relating to these Dispensaries including medicines, hospitalization and other reimbursable expenses (of pensioners), salaries and other allowances to the Postal dispensary employees as a result of merger of these dispensaries shall be borne by CGHS from its own resources. f) Local Committees shall be constituted in the respective cities with representatives from with representatives from both CGHS and Postal Dispensaries to resolve all staffing and other local issues arising on account of the merger in consultation with nodal Ministries. 4. These Orders shall be effective from 1st January, 2019. Additional Director of concerned CGHS City shall initiate action for taking over of Postal Dispensaries in consultation with the concerned Postal Authorities. 5. This issues with the concurrence of Ministry of Finance, Department of Expenditure’s ID No. 18(4)/E. V/2017, dated 26.11.2018.